Based on cloud slime recipes, this blue cotton candy cloud slime is soft, fluffy, stretchy, and smells just like the delicious candy treat! Who else loves cotton candy?! You know what else is a lot of fun?? 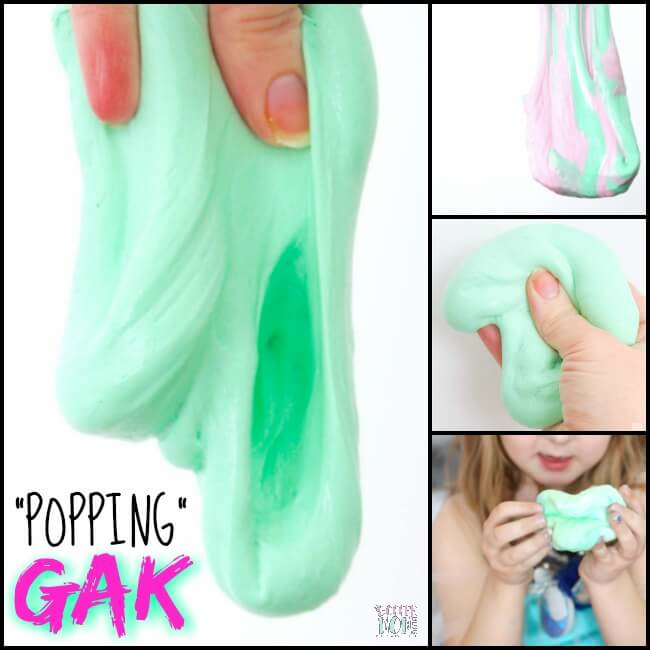 The girls and I have been making lots of different unique slime recipes for a couple years now, and each time we try a new recipe it is always an exciting experience. 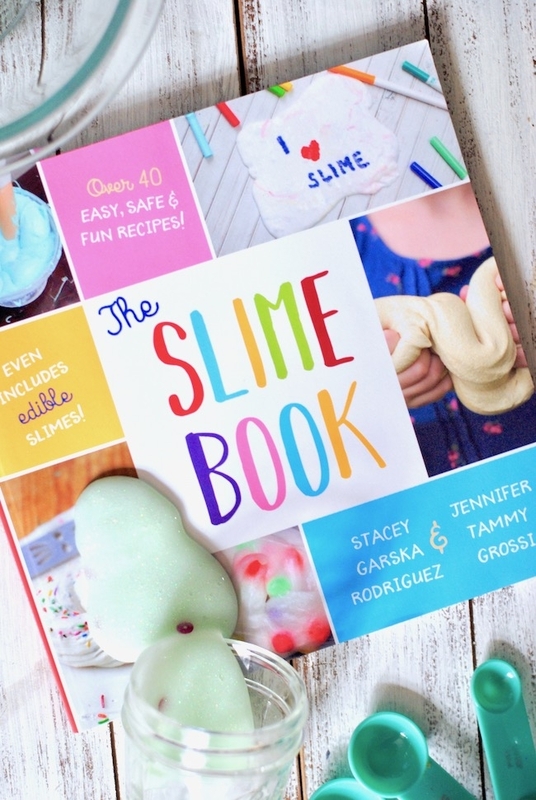 My friend and fellow blogger Jennifer and I make so much slime that we actually co-authored a book of slime recipes: The Slime Book. Her signature slime practically broke the internet last year! 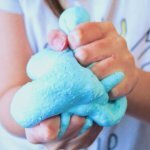 This blue cotton candy slime recipe is a variation of cloud slime and smells absolutely amazing, just like the airy spun-sugar treat! 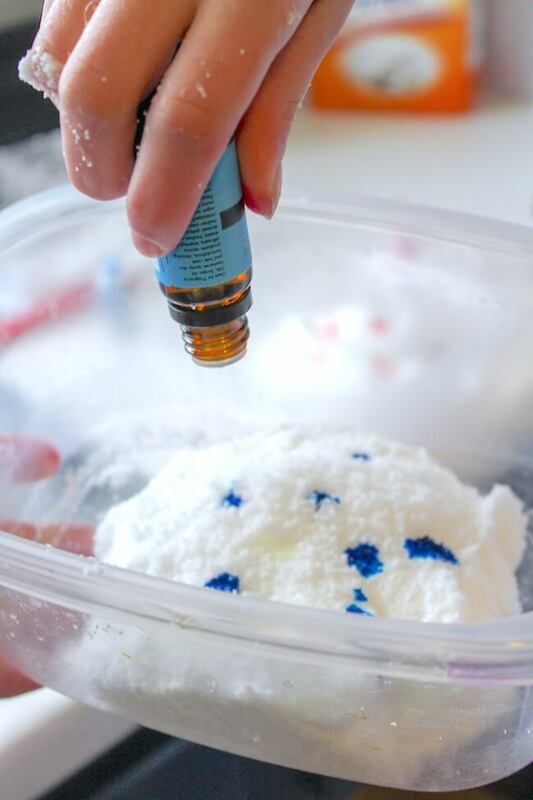 Cloud slime is a fluffy slime recipe that uses instant snow instead of shaving cream to achieve a light, airy texture. Because of it’s soft fluffy look and feel, we knew cloud slime would make the perfect base for cotton candy slime! 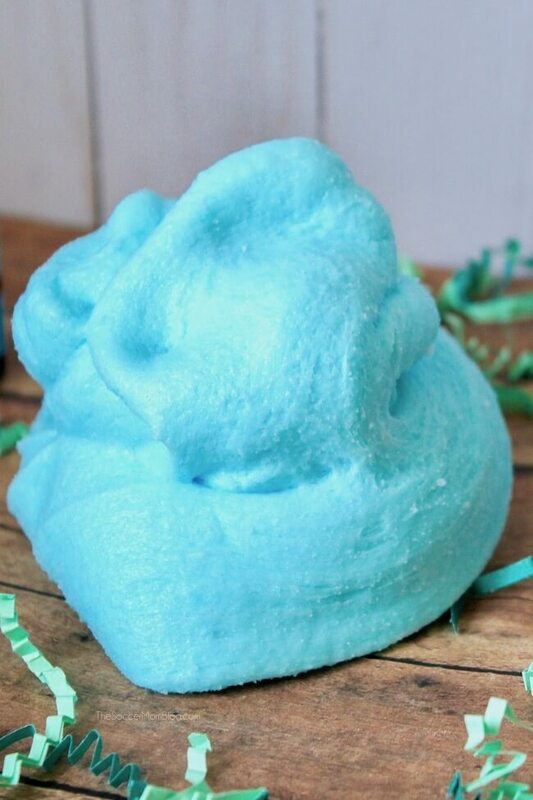 The result is a unique cloud slime recipe that looks, feels, and smells just like a big ball of cotton candy! 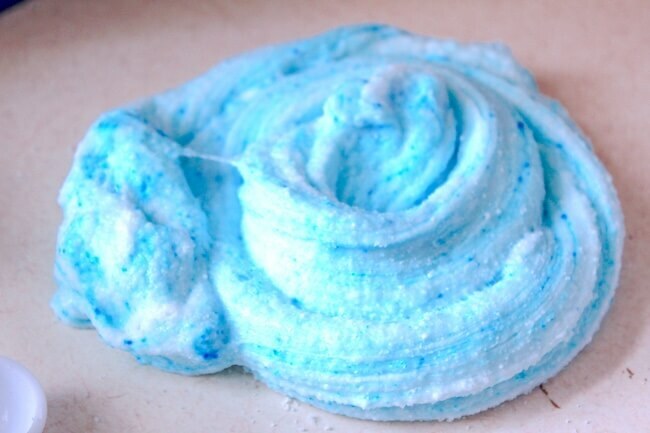 Keep reading for ingredients and step-by-step instructions to make our amazing Blue Cotton Candy Cloud Slime recipe! For your convenience, I’ve included shop-able ad links to the supplies used to make this cotton candy cloud slime recipe; our disclosure policy is available here. TIP: Avoid off-brand white glue and stick to the classic Elmer’s. For some reason, many of the generic brands simply don’t work well in slime recipes. Grab a free printable copy of our cotton candy cloud slime recipe and 1-minute video demo below the photo directions. Pour white glue into a large container for mixing. Slowly add the Sta-Flo one teaspoon at a time, mixing between each spoonful. This is your slime activator (this recipe is a liquid starch slime). Knead your slime — don’t worry if it is still sticky at this point, that’s normal. In a second mixing bowl, combine the instant snow and hot water — the instant snow will expand and “puff” up. 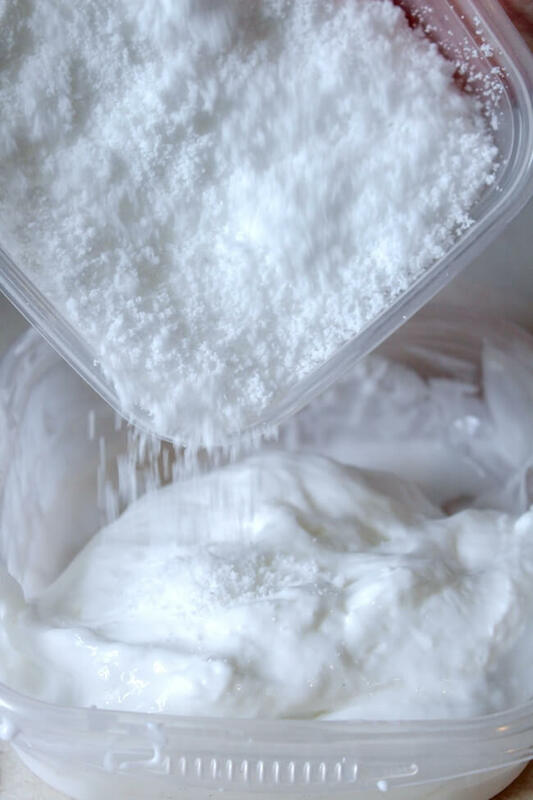 Add instant snow to your first mixing bowl with white glue slime and knead well. TIP: If slime is still sticky, add more liquid starch 1-2 Tablespoons at a time until slime no longer sticks to hands. Mix in the blue coloring. Start with 2-3 drops and add one drop at a time until you’ve achieved a rich blue. TIP: We used this food-grade soap dye because it is non-toxic and creates a vibrant colored slime that won’t stain hands. 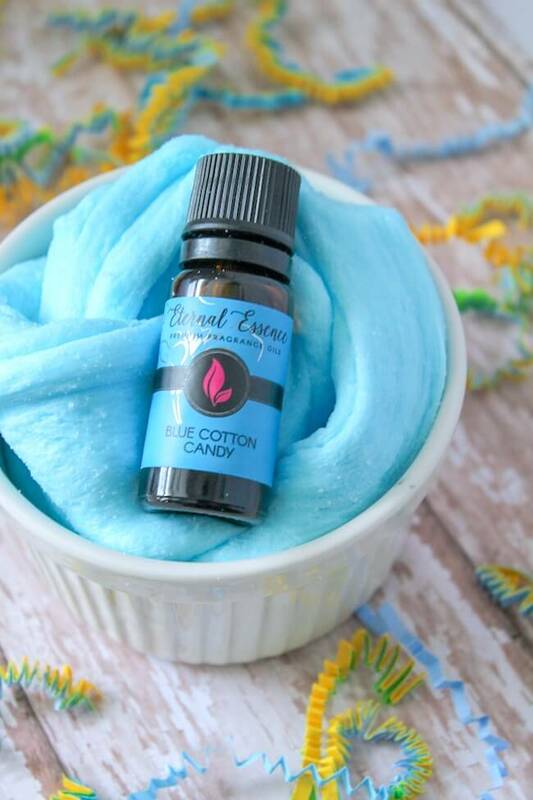 Add 2-4 drops of cotton candy scent and continue kneading until all coloring and fragrance is thoroughly incorporated. Store in an airtight container to extend the life of your cotton candy slime. While it smells just like the real thing, this cotton candy slime is not edible. Please do not taste or eat. 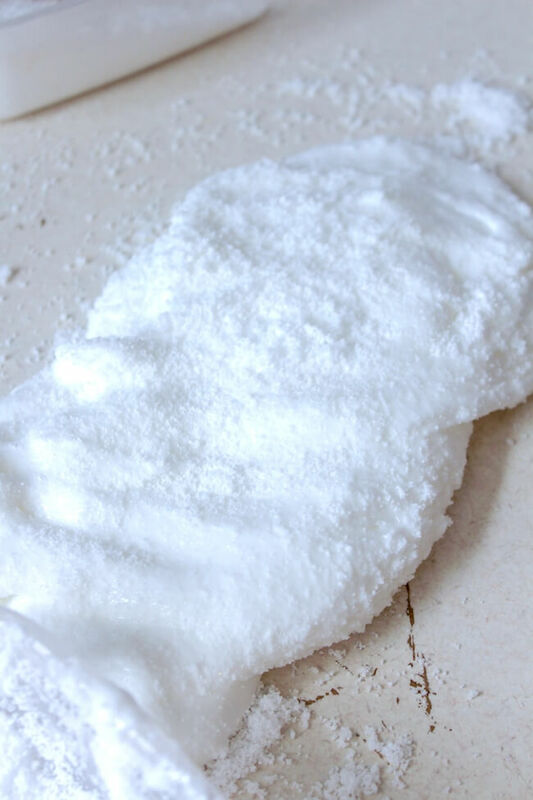 As with many slime recipes, this cloud slime recipe involves a chemical reaction. Some ingredients may cause irritation to sensitive skin. Wash hands thoroughly after play. 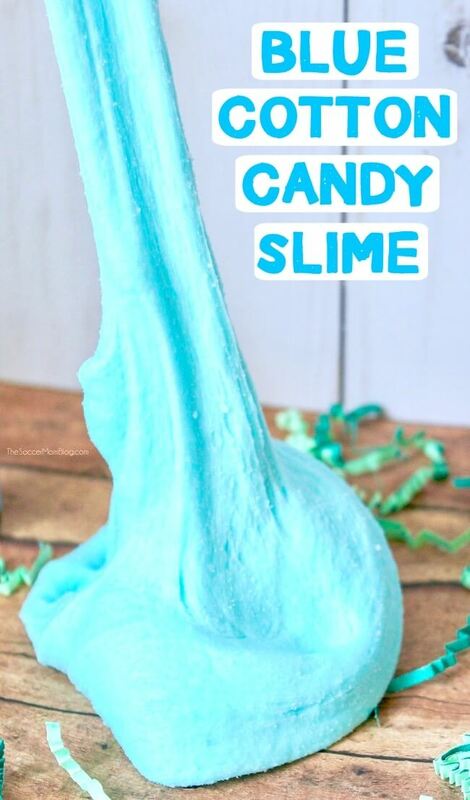 There are three starter slime recipes that form the base for hundreds of awesome slime variations, like this Cotton Candy Slime. Once you master these basic recipes, you can make almost anything! 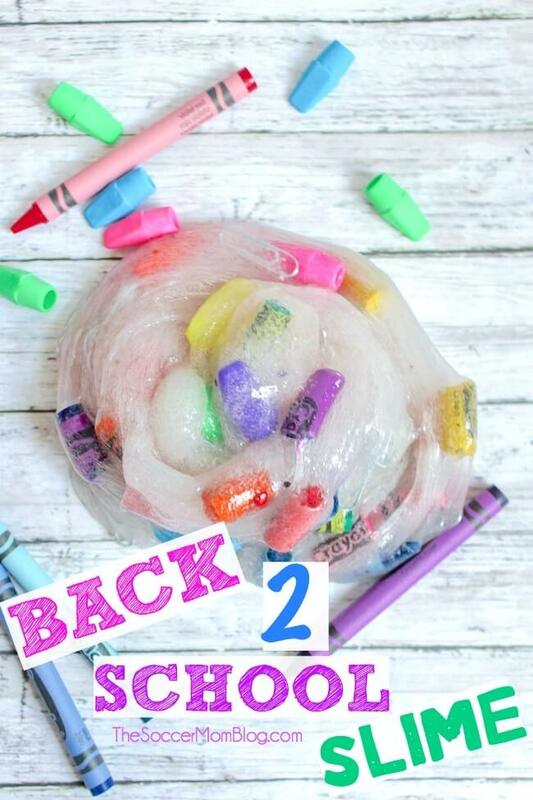 Have you made this cotton candy slime recipe? Let us know what you think in the comments below! 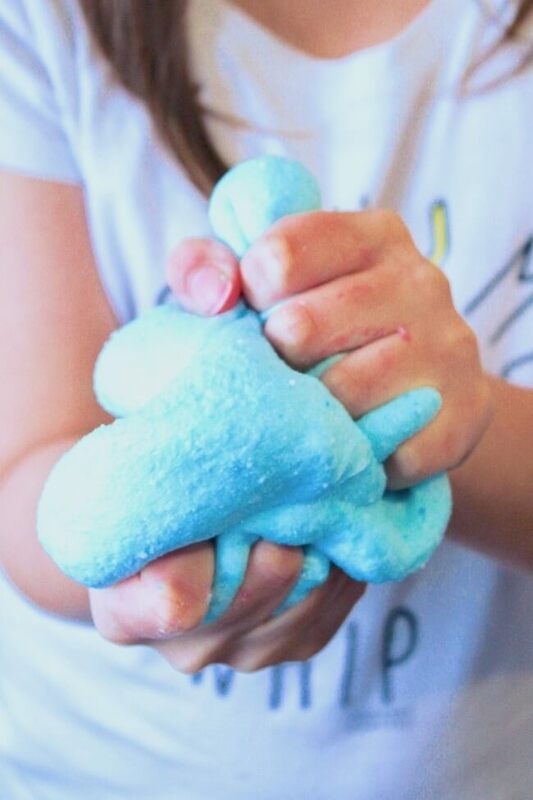 Our blue cotton candy cloud slime is soft, fluffy, stretchy, and smells just like the delicious candy treat! Slowly add the liquid starch one teaspoon at a time, stirring with each spoonful. Knead slime by hand - it may still be sticky at this point. In a second mixing bowl, combine the instant snow and hot water — the instant snow will expand and "puff" up. Add instant snow to your first mixing bowl with white glue slime and stir until you can't stir with a spoon anymore, then knead by hand. Mix in the blue coloring. Start with 2-3 drops and add one drop at a time until you've achieved a rich blue. This cotton candy slime is not edible - please do not taste. See all of our edible slime recipes in one place!